Thanks for all of your comments. The film had numerous red cell changes including fragmentation (schistocytes), Howell Jolly bodies, accanthocytes, spherocytes. 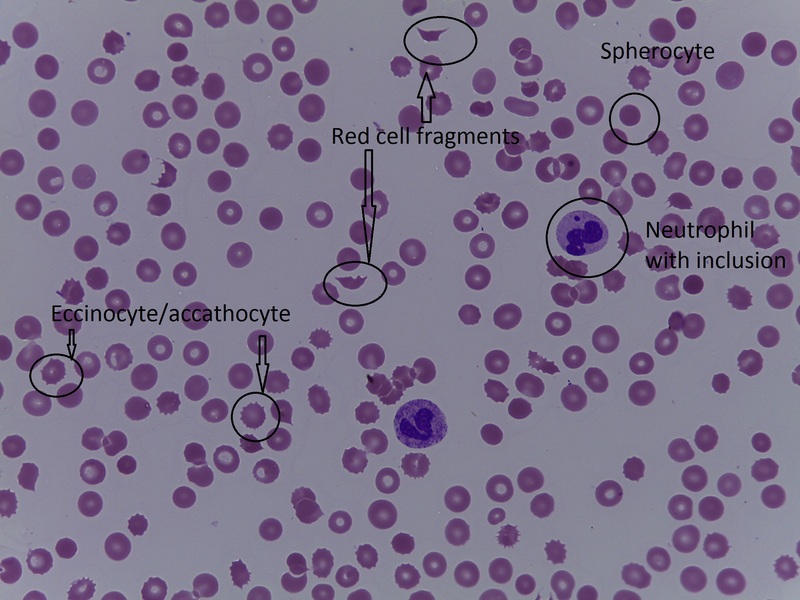 There was also thrombocytopenia and Howell-Jolly like inclusions in the neutrophils. The most significant finding are the red cell fragmentation. The patient had worsening renal failure and had been on ciclosporin. Once this was stopped the renal failure improved and the red cell fragmentation reduced. It was presumed a ciclosporin-related microangiopathy. Plasma exchange was not tried. We could never fully explain the Howell Jolly body-like inclusions in the neutrophils. They are seen in HIV infection, but there was not a viral cause here. Perhaps due to the ciclosporin as they also slowly disappeared. We also excluded other causes of red cell fragmentation such as transfusion. Although the DAT was positive (a specific DAT to look at IgG/M/A/C3d was not used) there was never any antibody detected from eluate. This entry was posted in Anaemia, Laboratory morphology, Platelet disorders, Transplant and tagged MAHA. Bookmark the permalink.